Meet your neighbor Joe Thompson, of rural Roseville. Joe was raised on a farm west of Roseville, by his mother, Elizabeth, along with his six brothers and two sisters. He graduated from Roseville High School in 1981 and from Monmouth College in 1985. 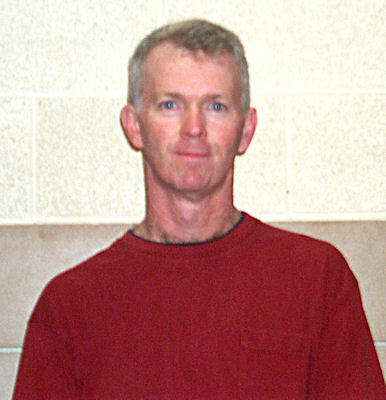 Joe is currently employed by the Monmouth-Roseville School District as a Physical Education teacher. He has taught and coached in the Roseville and now newly consolidated Monmouth-Roseville school district for 23 years. He was the head Jr. High boys basketball coach for 17 years, and also coached Jr. High track for approximately 10 years. In addition, he is the President/owner of Thompson Brothers Painting Inc. He bought this business from his brother when he was only 18 years old. Through many years of hard work and dedication he has built a well-known, successful business. It seems that this is sort of a family ritual, Joe says that of the seven boys in his family, six of them are involved in family owned/operated businesses. Joe is happily married to the former Amy Dowell, a native of Henderson County. They have two children, Carly, age 8 and Alec, age 6. They reside seven miles northeast of Roseville in a home they built in 1996. In his spare time Joe enjoys spending time with Amy, playing with his kids, painting-working, sports, fantasy football, running, and deer hunting.